My frail and charming old kitty, Tatsuko, has finally passed. For the past few years, Kij Johnson has had custody of her first in Seattle and then in Raleigh. I am grateful for the time I got to live with her, and grateful that Kij and several friends took such nice care of her after she moved. We got her in the late summer of 1995. 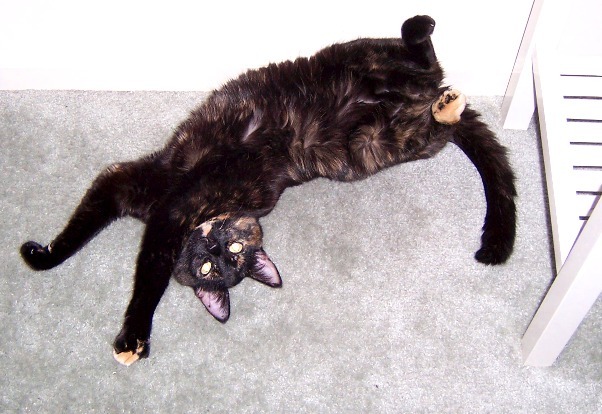 Bob was working in an emergency vet clinic in Oregon, and she had been run over by a truck. This encounter left her with a skewed pelvis and various other health issues, plus a hatred of change. Just moving across the hall to a brighter apartment (she was about a year old) made her panic - I remember her running back into the old (now empty) apartment and howling even louder to discover that even her old home looked different now. When we first brought her home, she lived under the covers for weeks, maybe even months, venturing out only when no one could see her for food, water, and the litter box. Eventually she grew braver and ferocious. She loved to wrestle, and for those of you who've raised kittens, you know this is code for "tear the skin of her humans." I learned to wear gloves when playing with her, and she learned that gloves = "I get to really attack!" She had asthma, though, so eventually she'd get to wheezing and gasping, so I'd leave her alone for a while until she settled down. This was especially fun when she was a little older: Her favorite toy became a dressage whip, which she'd chase for hourse if I'd let her, except for that she'd collapse from lack of oxygen at some point. Heck, sometimes she'd purr so profoundly that she would end up gasping for breath between each purr. Oh, that kitty! What a joy she was. I have fond memories of laughing myself silly watching her climb the walls in our old apartment after we finally gave up trying to discourage her. She literally clawed her way up the drywall to above head-level. Drywall can be repaired (and I did repair it later), but that was priceless. Later I realized she just needed an alternative, so I screwed a big carpet sample to the wall for her to use. She loved that, leaping up and sideways whenever I stood in the hallway near her "climbing wall," trusting that I would support her weight as she scrambled side-to-side. She loved to use her body, and watching her do so provided great joy - perhaps especially since that body was so damaged. Never have I lived with an animal who actually asked for her daily prednisone pill, because she knew she'd be rewarded with her kitty treat (chicken-flavored laxatone)... which also served as anti-hairball medicine. Win-win. 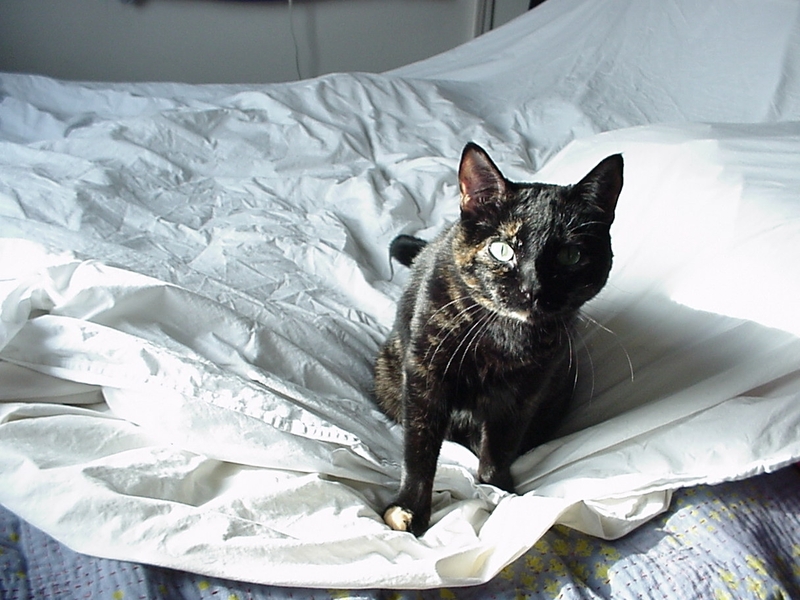 "When I wrote Fudoki, it was Tatsuko I wrote about: 'Her fur was at first a blurred darkness. 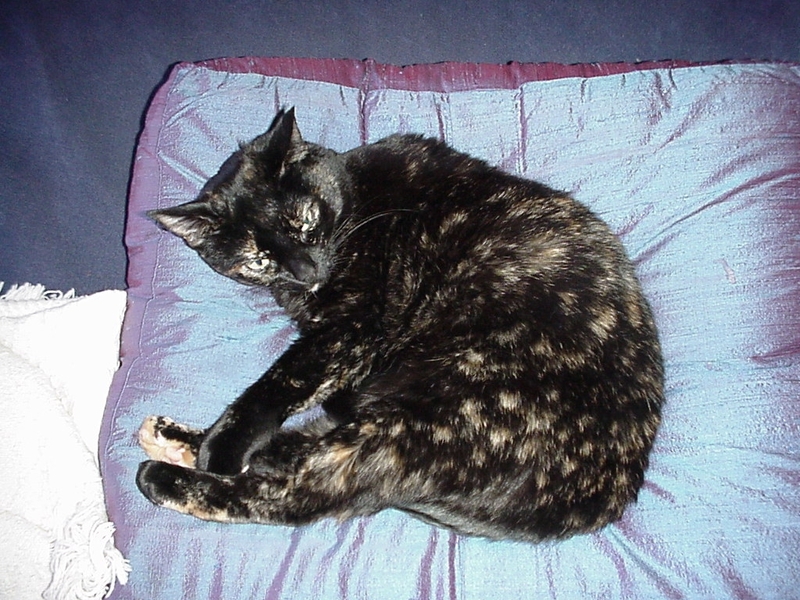 As she grew it changed to black flecked with gold and cinnamon and ivory, like the tortoiseshell of a hair ornament. Her eyes when they opened were gold, like a fox’s. She was small but fierce: in no way but size a runt, for she lacked the gentle resignation of the weak.' She had a butterscotch chin and three of her feet (but not the fourth) had butterscotch toes. She never weighed more than seven pounds. She had a chronic respiratory infection and a damaged pelvis from when she had been hit by a truck as a baby. She had the loudest purr I have ever heard. "She was a dragon-baby at first – small but fierce, indeed. She scrambled five and six feet up the bedroom walls, using her claws the way an ice climber uses her axe and crampons. When we left that first apartment, Chris had to fill hundreds and hundreds of tiny, claw-shaped holes. 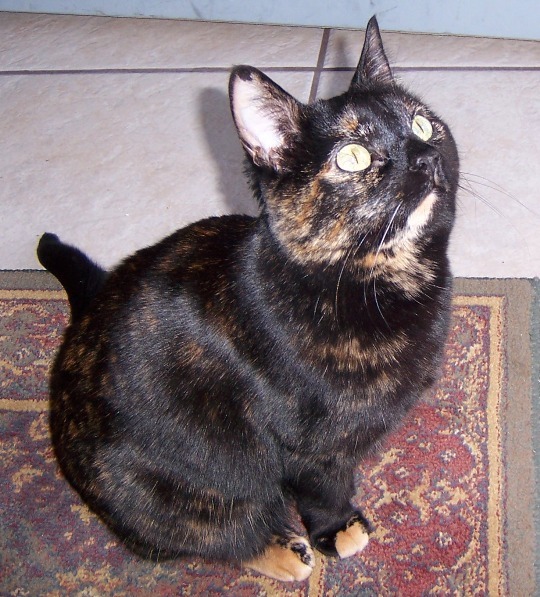 She also liked Monster Atomic Cat and Devil Paw, but as she aged she settled down and became a mannerly little dowager, bird-boned, pleasant and elegant. "I travel a lot and lots of people took care of her in Seattle and then in Raleigh: Nisi, Don and Vicky, Lorelei, Peter, Shelly, Kessel, Lew, Caroline, Eric, and so many others I can’t recall at the moment. She loved big hands and low voices. She also loved the water from canned tuna, roasted chicken, salsa, sleeping under the covers, sleeping on my head, sleeping on the couch, sleeping in the second bedroom, sleeping sleeping sleeping. Except for the salsa, she was a very traditional little cat." I got to see Tatsuko a few times via Skype since she went to live with Kij - including yesterday - which was so nice. Her purr was still so loud as to rumble the speakers on my computer, even the day before she died. She was so sweet and her affection so important to me during the rough years when last she lived with me, as I'm sure was true for Kij, as well. I don't really have the heart to write any more about my sweet kitty right now. Goodbye, Tatsuko. I love you. RIP Fetish kitty, Oct 1995 - Jan 28, 2011. Thank you all for your kind words on yesterday's post. Sid, Dog of Peace. And my other dogs. siro_gravity asked about me and dogs - don't I just have cats and hamsters? Yes, I've had dogs! My first dog was Senja, a Norwegian Elkhound. She became "my" dog when I was eight, and soon was a blue-ribbon winner at dog shows. I mean, how many young dogs obey an 8-year-old boy at a public show? She lived for another five years; I'll save the story of her end for another time. A couple of decades passed before I was ready for another dog. Kij and I got Sid from the Seattle Humane Society, where we had left a request that they contact us if they got a small, calm dog suitable for a tiny apartment. When they let us know they had a German Shepherd Dog that was "perfect for us," we were so sure they were wrong that we rode my motorcycle over to meet him. We went into the back room where all the dogs were kept and were met with a deafening cacophany of barks. This old German Shepherd sat quietly as the Humane Society worker opened the gate to his stall, then stood while the worker attached a leash and handed it to me. We walked Sid out into the exercise grounds, and he was so obedient and noble and calm - even in the face of wild dogs jumping all over - that we knew the shelter had been right. I rode home and got the car to bring him home. It soon became clear that he had been abused and had back injuries; he was very sad and quiet for a while. Then, suddenly, he became a goofball about three months in when he realized that we were his new pack. Sid lived with us for three years. RIP beloved Sid. My third dog was Hope. Hope was a rescue dog from the Lawrence, KS, Humane Society. They'd named her "Hope" because they hoped someone would adopt an old, anxious Collie-dog. We were softies, and the name worked out. She moved to Seattle with Kij in 2005, where she lived another couple of years. RIP sweet Hope. So: Yes, I have had dogs in addition to various other pets, including my One True Cat (The Great Helen of Peerless, Whose Face Could Launch a Thousand Combines; RIP Helen), my other two beloved kitties (Tatsuko and Sanju), and a number of mouses and hammies, including my One True Hamster (alternately Hammie-Boy and Hefner, who just passed away this spring). Okay, I'm off to fix my overheating Saab and fetch my repaired Vespa. Living with hamsters as pets guarantees frequent tragedy. As recently as Sunday, little Hefner was healthy and full of beans. On Tuesday night, he showed signs of serious illness, with a belly full of scabs and infection. I brought him to the vet on Wednesday, where the kind Dr. Gibbs gave him a shot of cortisone to slow the growth of (suspected) cancer and a shot of antibiotics to kill the secondary infection from his chewing on the growths. She said that if he responded well to those, she could compound him treatment to give him another week or two. Then he had a healthy and relatively energetic night and day today. Wouldn't you rather go when you felt well than suffer for a week or two? So we fed him his favorite foods - blueberries and nuts - and cuddled the little boy, then brought him over to the vet. The nurses at the front desk didn't even check us in, saw the teary eyes and brought us straight to an exam room. After some time alone with the sleepy Hammie-Boy, Dr. Gibbs took him to the euthanization room, and a few minutes later he returned asleep but not breathing in his ball. She said that he was full of tumors when she felt him after the procedure, so we had made the best decision. I dug a hole in the rodent cemetery in the back yard and buried him in his favorite toy, his ball, with a pint of blueberries. Hefner was the gentlest, most easy-going, but most curious hamster I've ever known. He would run in his ball for hours. He let little kids squeeze him and wouldn't bite. He would sleep in your lap. He loved peoples' shoes. He took food so carefully from your hand that he'd sometimes drop it. He invented the litter box for himself so he wouldn't have to sleep in a mess. He was the best hamster ever. We get so attached to our little friends. I'm not sure I want to keep doing this every few years. Perhaps a bit of a break before another little Rodent-American. Before Hammie-Boy started living with me, I wasn't aware that hamsters barked. Well, he's doing it now, in his sleep. I have a question for those of you "in the know" about hamsters: Do they all bark? Just the boys? Or is Hammie-Boy a rarity? PS: Just returned from physical therapy. No super-powers yet, but flexibility is increasing fast! Let's work together to make Kansas City a no-kill city. Please find a way to help us during this time. We have commitments that must be honored. Still life with hamster. And not so still. Don't change your clothes, don't fix your hair... just take a picture. Post that picture with no editing (except to reduce the size, of course). And just to prove I've followed the rules, a bonus shot. Guess who just dove from my arm? I think I'm saying something along the lines of, "Oh, no! Mr. Hammie-Boy!" RIP little Juno. I hope you get a better run next time around. I forgot to mention that I just adopted a new hamster! She was a mommy about two months ago, bearing nine (!) pups... which is why her previous parents gave her away. Such lovely markings, and so sweet! Who knew that there were tri-color hammies, too? At just five months old, she's already bigger than Chloe ever was. Plus she's quite muscular but gentle, even when she misses a piece of food and gets a big of finger, instead. Silly thing made her nest in the UFO wheel of the cage and totally ignores the nice nest-area that Chloe used to use. To each hammie her own, I guess. hamsters are cute! cats can be mean. On the other hand, Chloe is SO CUTE! Had folks over for gaming yesterday and ordered cheep Chinese delivery, and I saved a little broccoli and carrot. She loves these so much that she doesn't even stuff them in her cheeks - the way she does with everything else - but instead gobbles 'em up right away. So CUTE! Does anyone know where to find a full list of recalls on pet food? It appears that a second ingredient (beyond gluten) is part of the problem. This scares me because, yesterday, Tatsuko barfed immediately after eating. This in itself is not extraordinary, but in light of this news makes me nervous. Thanks to james_nicoll for the tip.